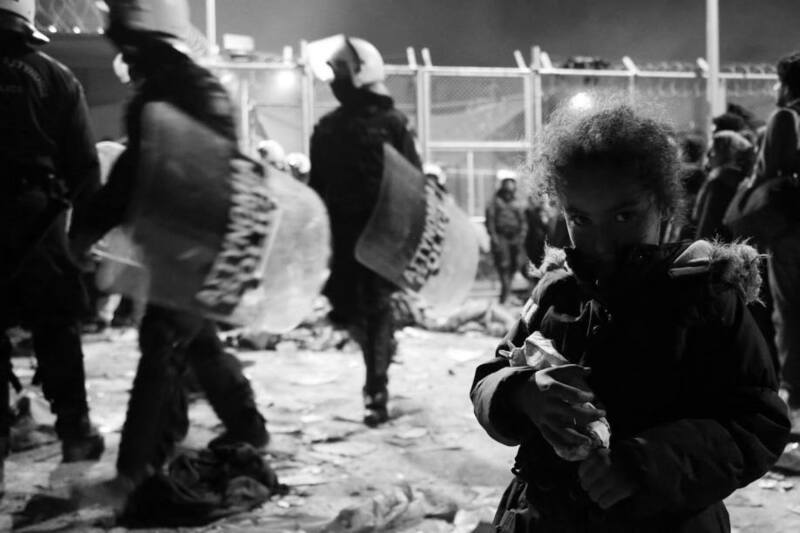 As a complement to our most recent post, a call for support from the Steki Social Centre in Thessaloniki, we publish an interview with Tasos Sagris from Void Network, for the radio program This Is Hell (u.s.a.), along with a video from sub.Media’s Trouble series entitled Refugees Welcome:Creating Solidarity Across Borders. Live from Athens, cultural activist Tasos Sagris from Void Network discusses with Chuck Mertz from the radio program THIS IS HELL (U.S.A.) the political and social work of anarchists in austerity-era Greece – to provide support and mutual aid to the victims of capitalism and war, to defend the people from fascist and state violence, and to build and occupy the framework for a new, horizontal society, against capital, and for each other. We can imagine a horizontal and happy future for everybody – but we cannot impose this on society. The society has to come towards us, talk about it, prepare the revolution and manifest the revolution, as a society, not as an anarchist political organization. The society will do the revolution, not the anarchists. The anarchists will be there to offer their power and bodies to this struggle, but society has to decide: do we want totalitarianism, or do we want anarchy? There is no other question at this time. Tasos Sagris and Void Network were featured in the New York Times article Anarchists Fill Services Void Left by Faltering Greek Governance. Helping Refugees Means Fighting the State. And Vice-Versa. Understand that this is not a struggle that we do for the refugees but with the refugees. The refugees can take care of themselves, and they can self-organize. If we help them and if the society around them is beneficial and helpful to them, then they can establish their own horizontal assemblies and create free spaces. Chuck Mertz: Anarchists are providing services in Greece now that the government is not, due to austerity. Let me repeat that: anarchists are doing what government cannot in Greece, and that is provide the necessary services to survive. So what is happening in Greece and why? And what is the New York Times getting so wrong about anarchism and Greece? Here to tell us, Tasos Sagris is a member of Void Network, a poet, a theater director, and for 28 years has been an anarchist cultural activist. Welcome to This is Hell!, Tasos. CM: How much is there an organized group right now within Greece of non-state actors not only providing the services one would expect from the government, but also the social guidance usually provided by the government? How much are the non-state anarchists defining what Greece is today? TS: We could say that this is part of a struggle that has been going for decades now in Greece from anarchists. Of course, me personally, I cannot speak as a representative of the anarchist movement, because the anarchist movement is very pluralistic. It includes many, many initiatives and many groups. I can speak only from my own perspective. Greek society faces austerity measures; the poverty of the people and unemployment is becoming worse and worse. At the same time we have had a great influx of refugees from different places, they were in war and now are in other countries. Of course the natural instinct among anarchists on this phenomenon is to help these people, and to work with them for a better life. We can’t say that we replace the state. The fight against the state continues and intensifies, also through the paradigm of our help and solidarity towards the refugees. Anarchists defend areas, neighborhoods, and social centers, the occupied buildings of the movement. Anarchists also created refugee squats, occupied the buildings where refugees can have their own assemblies and practice their self-organization with the help and solidarity of anarchists and autonomous people, also far-left people. All these people can fight together for a better future. CM: One of the amazing things I learned through doing research about Void Network and about anarchism in Greece is that this apparatus for helping out the poor and the people who had been affected by austerity had been put into place, and then when the refugee crisis came about, that same system was ready to help out the refugees who were in a very scary position. How much are refugees right now dependent upon the anarchists to provide them with the services that they so desperately need? TS: The state calls it the refugee crisis; it is just an effort of people to escape from the war and try to come into Europe. Anarchists established camps on Lesvos island and on the other islands where the refugees were coming. Anarchists established welcome centers on the islands. Then anarchists created an open camp in the central park of Athens, where the refugees were passing through on their way to the north in Greece, to the border, on their way to Europe. There were anarchists in the welcome centers in the beginning; there were anarchists in Athens; there were anarchists in Thessaloniki, in the north of Greece; and there were anarchists at the borders. So we created a network of people who welcome and help the refugees to continue their way to Europe. When the borders closed, of course we had to create spaces in the big cities to accommodate and shelter the people, to self-organize. Understand that this is not a project or a struggle that we do for the refugees butwith the refugees. The refugees can take care of themselves, and they can self-organize. If we help them and if the society around them is beneficial and helpful to them, then they can establish their own horizontal assemblies and create free spaces. The only reason that the anarchists are around is to defend the neighborhood from the police and the Nazis, and from other possible problems that they cannot bear alone. It is a mutual help. It is the real practice of mutual aid. When winter came, they opened the first big squat in Exarcheia, on Notara Street, very near the park. Then other refugees were coming more and more, so the anarchists opened more and more buildings around Exarcheia square. Now there are around ten to fifteen buildings. Some of them are for accommodation areas; there is a building for kids; there is a community health clinic in the square that the refugees are using also. There is also a specific squat for men who are without family or without children, who stay alone in order to avoid problems with the families. So this network of buildings, they help each other and they coordinate their defense and everyday life. In a society of inequality and exploitation, the organizing methods of anarchists look almost irrational. When you speak for horizontality, this doesn’t sound like “organizing.” The horizontal way of organizing among anarchists seems non-organized. But anarchist tools of organizing are becoming more and more popular all around the world. CM: But all the actions that the anarchists have been taking, and the social services that they have been providing within Greece, as you pointed out earlier, date back to 1990. So this is not only in response to the current government, nor is this only in response to austerity, which is something that has just been imposed recently upon Greece. So does it matter who is in government, or the policies that they implement, when it comes to anarchism and its social movement in Greece? TS: As we have been saying for many years now: whoever is governing, we will be ungovernable. We continue a long struggle to try to communicate with society and to offer society the analysis that capitalism and the state destroy their lives. This is taking place with two different strategies. One strategy is attacks on the police and attacks on the state and capital: big demonstrations, public visibility, and of course riots and fights with the police. When there is political power that can confront and defend places, neighborhoods and social centers, then you can build social services from an anarchist perspective. As long as you do not have consistency of struggle and consistency of fighting the police in the city, then you cannot defend the public spaces, you cannot defend the squats. It is crucial to understand that the effort that the comrades make and the risks that the comrades take to fight with the police in the city, in the streets, gives the anarchist movement the power to defend social centers and to defend occupied buildings. In these occupied buildings, we create revolutionary relations. We create horizontal assemblies where we put the revolution into practice. It’s in the streets and against the police, and against the state and against capitalism, that we fight the world as it is now. But inside the occupied spaces, inside the social centers, in the neighborhood assemblies, in the assemblies of the social centers, we have the existential experience of the revolution, of the anarchist society as we dream it to be. So it is not that we wait for the future, for the anarchist society to appear. We create the conditions of the existential experience of the anarchist society now, and the social centers are open to everybody, to share this existential experience with us. So this is an experiment of the revolutionary anarchist society here and now, and this creates more power for the struggles in the streets and the fight against the police. What does it say to you about the author’s understanding of anarchism when he sees anarchism and organizing as paradoxical? And how are anarchism and organizing not necessarily contradictory? TS: The thing is, in the eighties, the anarchists in Greece were seen by the public as more unorganized than they seem now. In every country, when the movement is young and new, and also small, it seems more antisocial because it seems much more against the common beliefs around anarchism. As the years go by, and more people come into the movement, and there are people who are older in the movement, and people from many different social backgrounds, from different workplaces, from different universities and schools, from different races or from different sides of life, the people also get a deeper analysis and more consistency. In this way, you succeed in explaining directly to society more and more what the anarchists believe. Now in our times, after the struggle against austerity measures that included the participation of anarchists, and the analysis that anarchists offered to society through pamphlets, through postering—millions and millions of posters all around Greece, in each neighborhood—explaining the reasons for austerity measures, explaining to people why capitalism and the state destroys their lives…now society has an easier time understanding there is a lot of organizing behind all of these efforts. Of course anarchists organize attacks against the state and capitalism. Anarchists use the methodologies of defense in the streets. Molotovs are the main tool of defense against the police, because it keeps the police away. When the police know that inside the big social demonstrations there are anarchists carrying molotovs, they cannot do whatever they want to the people. When the movement is small and young and it’s just the beginning, the movement isn’t able to overpower the ability of the media to describe you as they want to. So in a way, the New York Times tried to offer this ‘paradoxical’ comment as the way that they want to describe the anarchist movement in America. The anarchist movement in America, though, as a historical movement, offered a lot of inspiration to us over the decades, from the First of May in Chicago up to today—the American movement is very inspirational to Greece. Even, of course, the struggle of the Black Panthers. The social services programs of the Black Panthers is something very influential to the anarchist movement in Greece. There were many, many activists listening to this paradigm and taking inspiration from it. The New York Times is just trying to play with the popular idea about anarchists, that they are disorganized. But we have to understand that the anarchists are very, very organized. Still, in a pyramidical society, in a society of inequality and exploitation, the organizing methods of anarchists look almost irrational. In a society based on inequality, in an economy based on inequality, when you speak for horizontality, this doesn’t sound like “organizing.” When you have chiefs and bosses and prime ministers and all these hierarchies in society, the horizontal way of organizing among anarchists seems non-organized. But anarchists have their own tools of organizing: horizontality and solidarity. We think very, very seriously that these tools, these methodologies, are becoming more and more popular all around the world, and they are becoming more and more logical all around the world. Because people are still really terrified by what governments do to their lives. So for sure they come to the point that they have to self-organize, and the only way to self-organize is the anarchist way to self-organize, the horizontal way. How much are anarchists involved in firebomb-making? Because it seems to be something that the New York Times wants to make certain we know: that a big part of anarchist strategy in Greece is violence. How integral is violence to the anarchist cause within Greece? TS: Of course I have to explain that because of the history of struggles in Greece, we don’t have this debate about violence and nonviolence. Greek society in the last hundred years, we’ve had four or five revolutions, and four or five civil wars. Violence and nonviolence is of course debated; liberals try to impose the conversation in the mainstream media, but in the general society, the violence and nonviolence debate is not very crucial. To explain more: of course anarchists organize attacks against the state and capitalism. Anarchists are using the methodologies of defense in the streets. Molotovs are the main tool of defense against the police, because it keeps the police away. When the police know that inside the big social demonstrations there are anarchists carrying molotovs, they cannot come closer and do whatever they want to the people. This means that the use of molotovs produces distance between the people and the police. It also offers to all the normal people the opportunity to escape, to run away when the police attacks the people. The police uses unbelievable amounts of very strong tear gas against demonstrations in Greece. On the other hand, we have to understand that the mainstream media will try to use the violence on the side of anarchists as something that brings them outside the movement or brings them outside of the society. In the same moment, the society that has the experience of all these austerity measures, and also the experience of the lack of power to reply to all these measures, they see they benefited from the attacks of the anarchists against the police, because the police cannot do whatever they want in the city. Of course, they can use massive militant power and kill us all. Or they can throw tons of teargas and produce asphyxiation in thousands of people, thousands of demonstrators. How much are they going to do this? How many are they going to kill? Somehow, the refusal of the anarchists and of Greek society to appear like pacifists puts the state in its place. It sends a message to the state that you cannot kill us all. We are here to fight. Society has to come towards us, talk about it, prepare the revolution, and manifest the revolution as a society, not as an anarchist political organization. Society will do the revolution, not anarchists. Anarchists will be there to help and offer their power and offer their bodies for the struggle. But society has to decide: do we want totalitarianism or do we want anarchism? What’s wrong with voting? Is anarchism anti-voting? And does that make them anti-democracy? The problem with democracy is that it creates inequality. It forms inequalities and continues to use them. Of course the terminology of democracy is that the people have the power in their hands, can take their lives into their hands. But we cannot speak about representative democracy in this way. Representative democracy today doesn’t even exist, you know. The parliaments are so entrapped by huge economic interests around the world, it is not the parliaments that govern. They become soldiers. Technocrats and people who cannot speak politically get votes and come to parliament to “represent the people.” The people don’t feel represented anymore. Representative democracy is dead. We have to face this problem. When you realize that representative democracy is dead, there are two ways: fascism or anarchism. There is no other way. Society has to decide. Does it want more democracy, which means dictatorship? The other side of democracy is dictatorship, because democracy is there to defend the rights of economic interests. When people revolt, immediately democracy passes into dictatorship, passes into a state of emergency. This state of emergency, like we see now in Turkey for example, is a dictatorship. People have to decide: do they want more dictatorship? Do they want totalitarianism? Do they want a technocratic capitalism as a monopoly on the mentality of the people? Or do they want to think about something more than this? If they want to think about something more than dictatorship, something more than a technocratic totalitarianism, then we are here and waiting for them. Anarchists are open-hearted people creating horizontal assemblies with people to give them the chance to speak for themselves, to organize together, and to find solutions together. We don’t have a political way of manipulating people. We don’t want to manipulate people. That’s why we say we don’t want the people as voters, we don’t want the people as customers. We want people to participate, to share their experiences, to share their hearts, take care of one another, and to build communities that can fight capitalism and fight the state. This is the first step. We have visions for the future. We can imagine a horizontal and happy future for everybody. But we cannot impose this on society. Society has to come towards us, talk about it, prepare the revolution, and manifest the revolution as a society, not as an anarchist political organization. Society will do the revolution, not anarchists. Anarchists will be there to help and offer their power and offer their bodies for the struggle. But society has to decide: do we want totalitarianism or do we want anarchism? CM: Tasos, thank you so much for being on This is Hell! this week. TS: Thank you very much, and I hope all the people in the United States will understand what anarchism is, slowly, investigate what anarchism is, and take part in the struggle, because we need all of them. I hope that slowly the people will get more used to political analysis, because the problems are getting so big that the people will have to understand where they are very soon. Thank you very much. This entry was posted in Commentary, News blog and tagged anarchism, greece, migration, Okupations, revolution. Bookmark the permalink.